My most recent culinary experiment turned out rather delicious, I must say. Pasta isn’t exactly difficult to make, but I was proud that I made my very own, completely homemade sauce! My first course was the final cup of lentil-veggie broth that I made last week by boiling up all my vegetable scraps. For the vegetarian pasta sauce, I began by browning half of a small onion in a tablespoon-ish of oil. I added three tomatoes and let it cook down for almost an hour. A roughly chopped handful of mushrooms was added to the mix, and that was it! Salt and pepper to taste, of course. 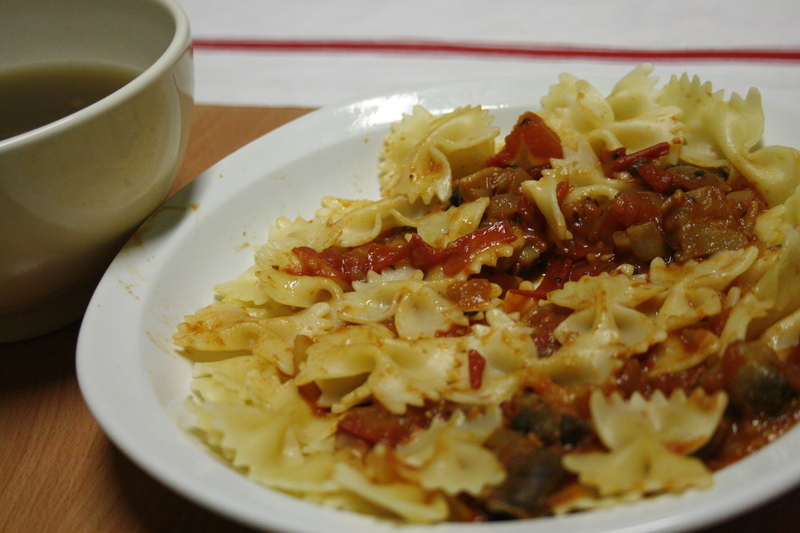 I cooked up some farfalle pasta and reached for my handy baguette, and dinner was ready. Beyond basic, almost healthy, and delicious. If I can do it, anyone can. This entry was posted in Uncategorized and tagged Beginner Cooking, Cooking, Food, France, Learning to Cook, Pasta, Vegetarian. ← Teachers Are Humans, Too. Yum and yum! Those tomatoes must have been cooked down to a sweet liqueur…the addition of the mushrooms for a meaty flavor was genius. LOVE!! I was pretty proud of myself! I have a newfound obsession with mushrooms. The title of this post caught my eye. I feel the same way! When I lived in France I ate pasta at my apartment daily. I wasn’t as good as you though. I bought my sauce (thank God they sold Uncle Ben’s sauce at Leader Price). Even though I’m back in the land of too many choices to purchase, I’m gonna try your recipe of homemade sauce. Thanks for sharing.